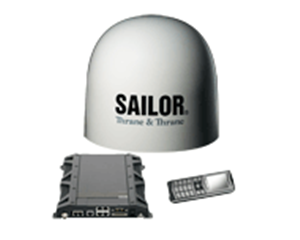 SAILOR 500 FleetBroadband is small and lightweight but enables a wealth of functionality including broadband internet/intranet, email and secure VPN with voice calling and data use simultaneously. Lower capital investment relative to competing connectivity services and flexible, simple installation, even by crew, enables cost-effective, high bandwidth connectivity and communication. Speeds up to 432 kbps bring the broadband experience to the oceans. With this much bandwidth available SAILOR 500 FleetBroadband enables the use of secure VPNs and custom IP applications. Empower your vessels with the latest technology. Improve performance with state-of-the-art remote monitoring, reporting and maintenance or enhance safety with telemedicine and distress alerting. With high quality voice and reliable multi-user data connectivity, SAILOR 500 FleetBroadband harnesses the power of global broadband at sea so friends and family are only a call or email away. Offer low-cost access to on-board telephones, broadband internet and personal email in order to support crew morale, retention and the safety and efficiency of operations. Designed to provide reliable operation in the harsh maritime environment, the SAILOR 500 FleetBroadband antenna is a fully stabilized 3-axis antenna with rate sensors for improved performance and fast, intelligent satellite tracking. Built to the world-renowned SAILOR standards, the antenna really does place SAILOR 500 FleetBroadband miles ahead of the competition and ensures reliable connectivity at all times. SAILOR 500 FleetBroadband can be transformed into a highly flexible multi-station voice solution, without the need for a separate PABX, simply by adding additional Thrane IP Handsets.